Join the discussion on our forums! Come discuss Microtech Controller over in our dedicated Microtech Controller discussion topic. 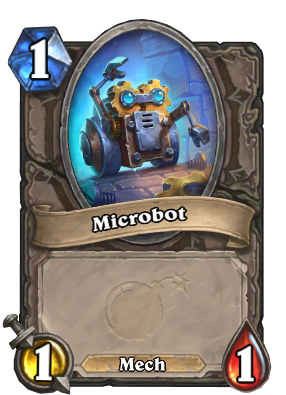 Battlecry: Summon two 1/1 Microbots. Lol, this arena card is actually played in tier 1 token druid deck; never thought it would ever be used in constructed. Starting to see play in high-level Shaman decks. It turns out that if you can spam enough token creators, eventually your opponent runs out of AoE and you can just Bloodlust them to death. Giggling Inventor does this card’s job better. Grim Necromancer costs 1 extra mana but has +3 health. The fact that this summons mech tokens doesn't matter as much because using your magnetic minions on 1/1 tokens is a pretty weak play. Between these two, Grim Necromancer is the better choice for a token deck. We've seen this card printed in a million ways, it never works. I don't even need to list them for you to know "big minion surrounded by tokens" is a staple in every other expansion and it never makes it into a deck, just arena. You may have forgotten, Dr. Boom was a well statted 7 mana 7/7. Ontop of that, the minions he summoned could deal enough damage to kill a minion, and he summoned two of them. This is 3 mana for 4/3, Dr. Boom was a 7 mana 9/9 that dealt 1-4 damage TWICE randomly. You cannot compare these two cards together. 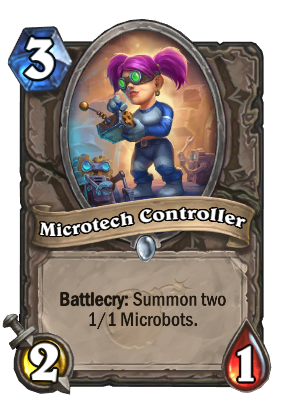 No, I can very clearly see that Dr. Boom is better, and I'm not expecting that Microtech Controller will find a place in the meta. But you said "big minion surrounded by tokens," and that accurately describes Dr. 7. 3 mana 4/3. Hm. All I can see is poorly drafted arena. Now we wait for MC tech and this to have kids in the next expansion.